We can now add Oman to the ever growing list of teetering or toppled Muslim country governments that already includes; Pakistan, Lebanon, Tunisia, Egypt, Yemen, Algeria, Bahrain, and Libya. Two people have been killed in clashes between security forces and protesters in the Gulf state of Oman, witnesses and officials said. Hundreds had gathered for a second day in the industrial city of Sohar to call for political reforms. At least five people were said to have been wounded when police fired tear gas and rubber bullets at protesters. Until now, Oman had mostly been spared the unrest which has affected other Arab states in recent months. Demonstrations are also taking place in the southern town of Salalah, according to Reuters news agency. Oman is yet another country in political turmoil that borders Saudi Arabia. If this unrest consumes Saudi Arabia, all world economic hell will break loose and you can expect to pay a lot more for a gallon of gas. Will the Saudis be able to keep the wave of regional ant-government rebellion from splashing across her borders? Is it a coup attempt or just police protests against salary cuts? The 24 hour rule is in effect. “We’ve treated 50 people in Quito for medical emergencies due to asphyxiation due to tear gas and impacts from pellets and teargas canisters,” said Jorge Arteaga, a Red Cross spokesman. Most of the injured had been involved in clashes outside the hospital where president Rafael Correa is being held. Mr Arteaga said that injuries were also reported in other Ecuadoran cities where rebel police took to the streets. Mr Correa was holed up at Quito’s National Police Hospital, where he was taken after a tear gas canister exploded near him when he addressed rebellious police at a barracks nearby. Although the police are surrounding the hospital and preventing him from leaving, Mr Correa told ECTV television that he is still running the country. “They’re not letting me out,” Mr Correa said. “They’ve got all the hospital exits surrounded. “Obviously, it’s a kidnapping, when you kidnap the president,” he added. Mr Correa said he would not negotiate with the officers while he remains a captive. “I’d rather die,” he said. A defiant Ecuadorian President Rafael Correa returned safely to the presidential palace late Thursday after spending hours held by police inside a hospital room outside Quito. Ecuador coup attempt? President Rafael Correa attacked in police revolt. Obviously, it’s hard to tell exactly what’s going on in Ecuador at the moment, although it seems that it might be a failed coup attempt. It was 35 years ago today . . .
Operation Frequent Wind . . . as told by Chris Woods, Crew Chief of Swift 2-2. “Gentlemen, start your engines.” The laconic command copied from the Indianapolis 500 auto races, echoed from the 1MC, the public-address system of the U.S.S. Hancock. Moments later, the Commanding Officer of Marine Heavy Helicopter Squadron 463, LtCol. Herbert Fix, lifted his CH-53A Sea Stallion off the deck of the aging carrier. When the other seven choppers in his squadron had left the deck, they fluttered off in a tight formation through blustery winds and dark, ominous rain clouds that hovered over the South China Sea. 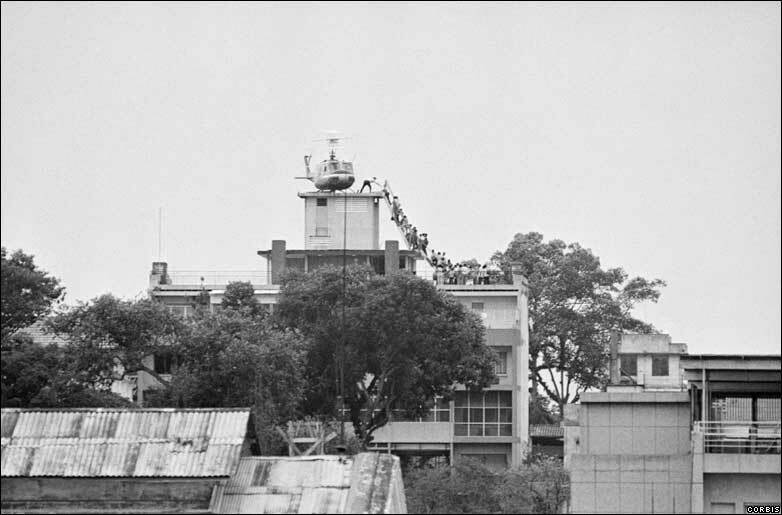 Operation “Frequent Wind,” the emergency evacuation of the last Americans in Saigon was under way. The rescue operation had been delayed as long as possible-too long, in the view of many Pentagon officials. In recent weeks 44 U.S. Navel vessels, 6,000 Marines, 120 Air Force combat and tanker planes and 150 Navy planes had been moved into the area. Nevertheless, Secretary of State, Henry Kissenger and the U.S. ambassador in Saigon, Graham Martin, argued that the final withdrawal of the American community would probably set off a wave of panic in Saigon and hasten the fall of the South Vietnamese government. During the preceding eight days, U.S. planes had evacuated almost 40,000 American and South Vietnamese refugees from Tan Son Nhut airbase near Saigon. By last week, the airlift was growing increasingly dangerous. Artillery shells and rockets closed Tan Son Nhut airport Monday morning, April 28, 1975. The next day, an U.S. C-130 transport was hit by a rocket on the runway and burst into flames as the crew escaped. A short time later, two Marine Corporals, Cpl. N. McMahon of Massachusetts and LCpl. D. Judge of Iowa, guarding the US defense attache’s compound at Tan Son Nhut, were killed by Communist artillery. Plainly, evacuation by commercial flights, by military airplanes or by sea was no longer feasible. The security advisers discussed whether conditions might permit a resumption of the military airlift. If not, they would have to go a fourth option, the riskiest of all: evacuation by Marine helicopters. Scarcely two hours after the meeting ended with no decision, Ford learned that two C-130s attempting to land at Tan Son Nhut had been waved off; the airport was blocked by thousands of panicky South Vietnamese, by then all of Ford’s advisers, including Martin agreed that it had to be “Option Four.” At 10:45 p.m., the President ordered Operation Frequent Wind to begin. Kissinger telephoned Ford to report that a fleet of 81 helicopters was about to embark on its mission, then, at 1:08 a.m. Tuesday, he called again with the news that the evacuation had begun. In Saigon, the center of activity for much of the day was the landing at Tan Son Nhut airport, a tennis court near the defense attache’s compound. Landing two at a time, the helicopters unloaded their squads of Marines- 860 in all, who reinforced the 125 Marines already on the scene- and quickly picked up evacuees. By nightfall, the mission had been completed at Tan Son Nhut, but the evacuation of the embassy was still to be accomplished. Sheets of rain were pelting the city, and visibility had dropped to barely a mile. Some choppers had to rely on flares fired by Marines within the embassy compound to find landing zones; others homed in on flashlights. Through Tuesday night, the Vietnamese crowd grew uglier, hundreds tried to scale the ten-foot wall, despite the barbed wire strung on top of it. Marines had to use tear gas and rifle butts to hold back the surging mob. Some screamed, some pleaded to be taken along. Floor by floor, the Marines withdrew toward the roof of the embassy with looters right behind them. Abandoned offices were transformed into junkyards of smashed typewriters and ransacked file cabinets. Even the bronze plaque with the names of the five American servicemen who died in the embassy during the 1968 Tet offensive was torn from the lobby wall. Marines hurled tear-gas grenade into the elevator shaft; at time the air was so thick with tear gas that the helicopter crews on the roof were effected. As many as 130 South Vietnamese planes and helicopter, including F-5 fighter-bombers, transports and attack planes, were reported meanwhile to have reached the US run Utapao airbase in Thailand with about 2,000 soldiers and civilians; already some 1,000 Cambodian refugees were crowed into tents there. Alarmed, the Thai government announced that the refugees had to leave within 30 days and that it would return the planes to “the next government in South Vietnam.” Defense Secretary James Schlesinger firmly advised Bangkok that it should do no such thing; under aid agreements, the equipment cannot be transferred to a new government but must revert to U.S. possession. By the end of the week, another seven or so South Vietnamese helicopters had landed or tried to land on the U.S. naval vessels. One South Vietnamese pilot set his chopper down on top of another whose blades were still turning. Others ditched their craft and had to be fished out of the water. An American search-and-rescue from the U.S.S. Hancock crashed at sea, and two of its crewmembers, Captain William C. Nystul and First Lieutenant Michael J. Shea were listed and missing, possible the last American fatalities of the war. The Crew Chief, Cpl. Steve Wills and the left gunner were rescued by another CH-46, Swift 0-7, during a zero visibility, night water landing to pick up the two wounded Marines. “The last days of the evacuation were very hairy indeed,” Ford confesses afterward. “We were never sure whether we were going to have trouble with the mobs.” As Ford noted, the whole operation had gone better “than we had any right to expect.” According to the Defense Department, 1,373 Americans and 5,680 South Vietnamese- many more that the US had originally intended- had been removed. Another 32,000 desperate Vietnamese had managed to make their way by sampan, raft and rowboat to the US ships offshore, bringing to about 70,000 the number evacuated through the week. For the next three hours the Marines wait, and grow more concerned as they discover no one responds to their radio signals. Finally, after they have resigned that they will not be rescued, and have voted to make an Alamo-like stand, the Marines hear the familiar sound of rotor blades slapping the humid air, a CH-46 Sea Knight, and two AH-1G Cobra escorts come in to view. Dodging small arms fire and using riot control agents against people attempting to force their way to the rooftop, Major Kean and his 10 Marines boarded a HMM-164 CH-46 helicopter, Swift 2-2. 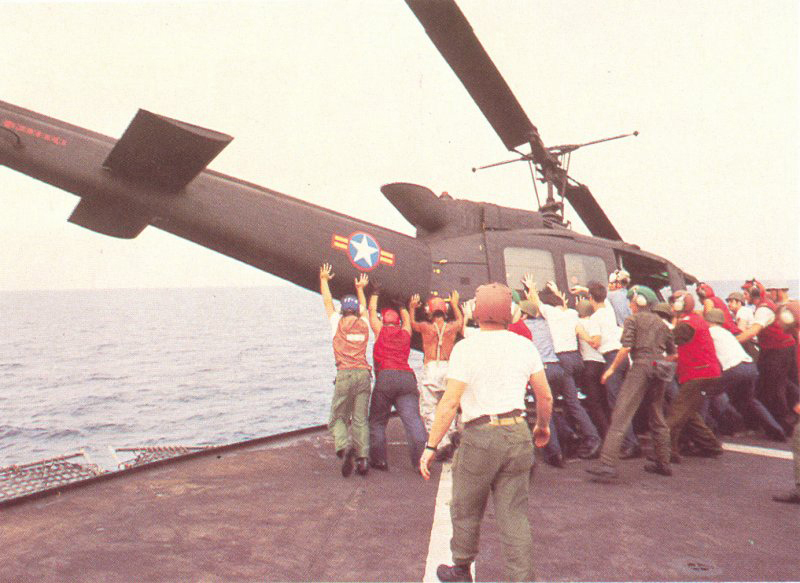 After closing the ramp, Swift 2-2 (piloted by Captains Holden and Cook, and crewed by Sergeant Stan Hughes, left machine gunner and Sergeant Chris Woods, Crew Chief and right gunner) lifted into a hover and the pilots were overcome by CS gas had to set back down on the embassy helo pad. Regaining their composure, Captain Holden lifted the helo and departed the embassy rooftop. The last American helicopter to leave South Vietnam, Caption Holden radioed the last official message from Saigon: Swift 2-2 airborne with 11 passengers, ground security force onboard. Clearing antennas and church steeples, Swift 2-2 picked up the Saigon River and descended to tree top level and followed the river out to the awaiting American Forces. During the flight along the river, Sergeant Woods sighted approximately eight communist tanks, parked side-by-side, waiting until the eighth hour to enter the city. Checking his watch, Major Kean noted that it was two minutes until eight, only 23 hours since the NCOIC of Marine Security Guard, Manila, had called him to relay a message from his wife in Hong Kong that she was pregnant. Only 32 minutes later on that unforgettable day, 30 April 1975, the 11 Marines exited Swift 2-2 onto the deck of the U.S.S. Okinawa. At this juncture, thinking the mission complete and the Ambassador safe, Captain Walters headed back to the USS Okinawa. Subsequent to his landing at approximately 0700, the command realized that Captain Walters did not have the remaining Marines on board. Due to a misunderstanding and miscommunication, they were still at the Embassy. General Carey immediately recycled the HMM-164 CH-46 “Swift 2-2”, but by this time due to the ships’ offshore movement, the time required to reach the Embassy exceeded 40 minutes. With two hours of fuel on board, the CH-46 did not have any room for error. Swift 2-2 landed on the USS Okinawa with two “LOW FUEL” lights, or 20 minutes of fuel remaining. It appears that both sides are now painting themselves into two irreconcilable, mutually exclusive, opposite corners in this zero sum game for control of Iran, the country isn’t big enough for the both of them. There can only be one winner here. Iran’s opposition leaders faced new threats Thursday with the state prosecutor warning they could be put on trial if they do not denounce this week’s anti-government protests – the worst unrest since the immediate aftermath of the disputed June election. Police firing tear gas and wielding batons dispersed opposition supporters trying again Thursday to gather in two locations in central Tehran, said an opposition Web site called The Green Road. Police detained many of them, it said. The information could not be independently confirmed due to restrictions barring journalists from reporting on opposition activity in the streets. The confrontation between Iran’s clerical rulers and their opponents has returned to the streets in recent weeks, after a harsh crackdown immediately following the election had all but put an end to demonstrations. Despite a continuing tough response from security forces, the opposition movement has regained some momentum. Iran’s most prominent opposition leader launched a defiant broadside at the regime of President Mahmoud Ahmadinejad on Friday, striking back after two days of heavy criticism by supporters of the regime. Mir Hossein Mousavi, the former presidential candidate who has become the opposition movement’s de facto leader, criticized a harsh government crackdown on protesters Sunday, and said he was willing to die in the fight to allow the Iranian people to express their religious and civic rights. Mr. Mousavi, in his Internet posting Friday, said he “has no fear of becoming one of the martyrs” for the cause, and he challenged regime officials who have threatened to prosecute him and other leaders of the opposition. The statement comes after two days of outpourings by government supporters against the opposition and Mr. Mousavi personally. On Wednesday, tens of thousands of regime backers demonstrated, sometimes raucously, in solidarity with Mr. Ahmadinejad and Supreme Leader Ayatollah Ali Khamenei. During some rallies, government supporters chanted against Mr. Mousavi and his opposition partner, Mahdi Karroubi, another unsuccessful candidate in the June 12 presidential elections, calling for Mr. Mousavi’s death and the execution of protesters. On Thursday, Iran’s state prosecutor warned that opposition leaders could face charges if they didn’t renounced recent protests. On Friday, Iran’s deputy head of the judiciary, Ebrahim Raisi, called pro-opposition protesters enemies of God, or mohareb in Farsi, a crime punishable by death under Iranian law, according to the Associated Press. This is the best opportunity for a regime change in Iran that the West is ever going to get. While I agree that direct intervention would be the wrong course of action, the United States and the rest of the West need to do something to take advantage of this situation, we just can’t remain neutral and sit idly by. Hundreds of thousands of Iranian mourners, including opposition leaders and influential senior clerics, attended the funeral of the country’s top dissident cleric in the holy city of Qom on Monday, turning the event into one of the largest antiregime protests the city has seen in three decades. The funeral procession of Grand Ayatollah Hossein-Ali Montazeri, one of the regime’s harshest critics, began peacefully. But opposition protesters used the charged event to chant against Iran’s leaders, and security forces and riot police responded by attacking mourners with shoes, stones and tear gas, according to news reports and videos circulating on the Internet. On Sunday, Supreme Leader Ayatollah Ali Khamenei issued a condolence message for the deceased cleric, a founding architect of the Islamic Republic, who fell out with the regime in the late 1980s. Mr. Khamenei offered his regrets but pointed out that Mr. Montazeri had strayed from the ideals of the 1979 revolution. When the message was read to mourners in Qom on Monday, many jumped up and down, booing and screaming “Khamenei is a murderer. His leadership is finished,” according to videos posted to opposition Web sites and to YouTube. By nightfall, Mr. Montazeri’s house was under siege by security services, his son Ahmad told the BBC’s Farsi-language service. Mr. Montazeri’s family canceled a memorial service planned that evening at a mosque in Qom, according to a statement issued by his son and posted on opposition Web sites. “We received word that Basij and Revolutionary Guards have entered the mosque and are waiting for us with batons,” Ahmad Montazeri wrote. Authorities have banned press coverage of the event. Iranian Web sites that posted accounts have reported reliably on protests in the past, and videos posted on YouTube match their accounts. The BBC’s Persian service, a source of news for many Iranians, was jammed Sunday, knocking it off air inside Iran, the British Broadcasting Corp. said. Opposition leaders Mir Hossein Mousavi and Mehdi Karroubi, as well as Mr. Khamenei’s brother, Hadi, who is also a critic of the regime, attended the funeral. Mr. Mousavi’s Web site, Kalameh, reported that his car came under attack on his return trip to Tehran, and a bodyguard was injured, but Mr. Mousavi was unharmed. The opposition called for the grand ayatollahs of Qom, Iran’s highest clerical officials, to call for a national day of mourning Tuesday to protest what the opposition called the insulting way the government security forces treated mourners in Qom. Qom serves as the spiritual capital of Iran’s ruling clerics. A dusty city in the desert plains south of Tehran, it is dotted with turquoise minarets and golden domes, and has been instrumental in shaping Iran’s politics for the past century. Analysts said Monday’s massive protests in Qom and the presence of high-profile grand ayatollahs in the funeral ceremonies elevated the opposition’s profile, further denting the credibility of Mr. Khamenei and President Mahmoud Ahmadinejad. “Mr. Khamenei’s legitimacy was questioned in Qom today, and that is a significant blow to the regime. It will be extremely hard to recover from this,” said Mohamad Javad Akbarein, a former cleric from Qom and a Shiite scholar now living in Beirut. Mr. Montazeri was once in line to succeed the founder of the revolution, Ayatollah Ruhollah Khomeini, as supreme leader. But he fell out with the regime and became one of its highest-profile critics. In recent months, a protest movement ignited by contested June 12 elections adopted the frail cleric as its spiritual leader. Opposition leaders, including Messrs. Mousavi and Karroubi and their supporters, accused Mr. Ahmadinejad of stealing the June vote, which the government denies. Over months of protests since, demonstrations have veered from protesting the elections and its results to denouncing the regime itself. Grand Ayatollah Hossein Ali Montazeri, R.I.P.